The Fashionably-Forward Foodie: Bogart's UPDATED! I originally posted about Bogart's here and here. Mom and I love Bogart's wide variety, but we especially love that everything we try there is exceptionally good! You will find Bogart's pretty busy throughout the day. Many come in after hiking Diamond Head hike and cooling down with a refreshing Acai Bowl. I, on the other hand, love their Crab and Avocado Omelette, and have come in for it a number of times! Recently, I passed up one of their newest items, Garlic Shrimp Fried Rice, for my favorite Omelette. The omelette was delicious and satisfying, but the G.S. Fried Rice was constantly on my mind! The next day I went back for it. Was it everything I had hoped it would be? The answer is an emphatic YES. 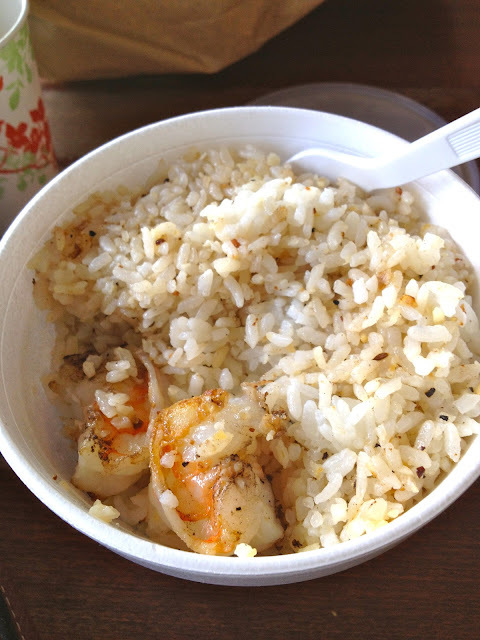 The fried rice only had three simple ingredients- Garlic, Shrimp and Rice. But, to be honest, that's all it needed! Other than that, I assume the fried rice was correctly seasoned, as it wasn't bland at all. But beware, you will definitely be keeping the vampires away for the rest of the day and even maybe the next day after eating this! Crepes No Kai 'Oi UPDATED!